Cleo Mussi is known for her humorous twists and attention to detail as observed in her solo touring installations: ‘The Crowd’, ‘A~Z- a hand book’ , ‘Pharma’s Market’-A live stock and produce show’ and ‘All Consuming’. She has also completed a number of large commissions for public spaces including The John Lewis Partnership in Solihull and The BBC Asian Network in Leicester. Cleo Mussi’s exhibitions are often large installations of up one hundred individual elements. 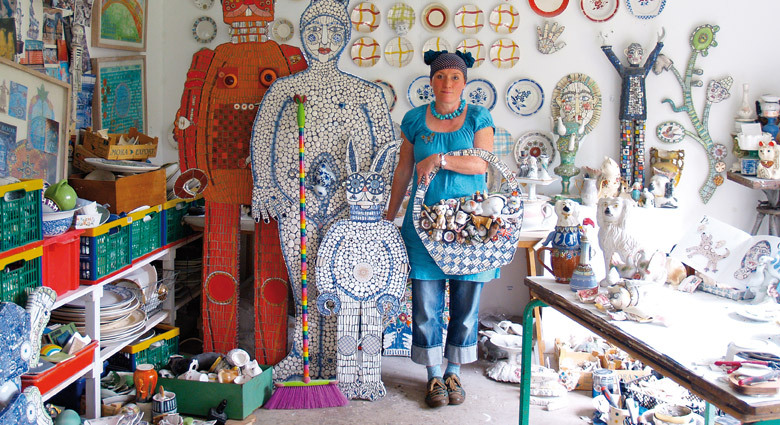 The narrative within her work is reflected within the ceramic that she incorporates. She recycles a large proportion of her materials; the combinations of marks and glazes as well as functional forms are combined to produce works whose content reflect design styles and fashions within British ceramic history incorporating aspirations and desire for ornamentation across the classes. The work holds cross cultural references in fashionable design , travel and commerce and represents the story of industrial ceramic history. Chinese ceramic meets Wedgewood, Poole sits next to Japanese porcelain and Staffordshire unites with Homebase to form a unique and motley collection of work.